It can be a little wet and muddy sometimes, wellies or suitable footwear should be worn! You will be asked to walk over a disinfected mat for bio security. Come and meet our gorgeous alpacas! 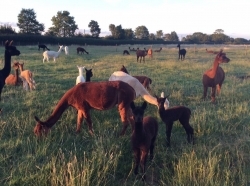 On our walk and talk you will have the chance to get up close to our alpacas and watch them in their paddocks. 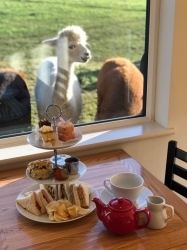 You will be guided round their fields as we chat about the history, our 12 year journey and facts about alpacas, and ask as many questions as you like. Last years cria (babies) are growing and we have around 20 cria are due throughout June, July and August, you may see a birth!! After the guided tour, we will show you the wool process, from paddock to product. You will also have the chance to view our products and take a souvenir home if you wish. We are a working farm, please wear suitable clothing and footwear as the ground is uneven and can get very muddy! We look forward to welcoming you to our herd!